It is the Monday before Thanksgiving, and I am hurrying like a mad woman. For a week, I have been testing recipes to give you something new for your Thanksgiving table. I tested a sweet potato cheesy casserole, a sweet potato hash, a sweet potato soup and a sweet potato torte. I even tried a mash and a soufflé. Yet, the only one that truly blew my mind and I find worthy of this celebration is this Sweet Potato, Pecan, Chipotle and Crema Puree. Not only is it so very fabulous, but it can be made in a snap, too. The sweet potatoes are cooked until completely soft, then pureed with nutty pecans that have had the chance to gently simmer with milk, thyme and nutmeg. A dash of chipotle in adobo gives it a smoky and barely spicy backdrop. It is finished with a splash of Mexican style cream, or crema, to make it even more creamy, with a slight tang, and irresistible. I may be making it again on Thursday in New York City. We have some very close Mexican friends who live there and every year we take turns hosting. This year, we are packing up and taking the regional train to the city, and if my friend Viviana agrees, I will whip this up in her kitchen. Here you go. Will you please, please, please, give it a try? I promise it will be worth your time. Wishing you all a warm, healthy and happy Thanksgiving. Place pecans, nutmeg and thyme in a small saucepan and cover with the milk. Set over low heat, once it comes to a gentle simmer, turn off heat and cover. Let it sit while the sweet potatoes cook. Bring salted water to a rolling boil over high heat in a large saucepan. Add the sweet potatoes, making sure the water covers them and reduce heat to medium. 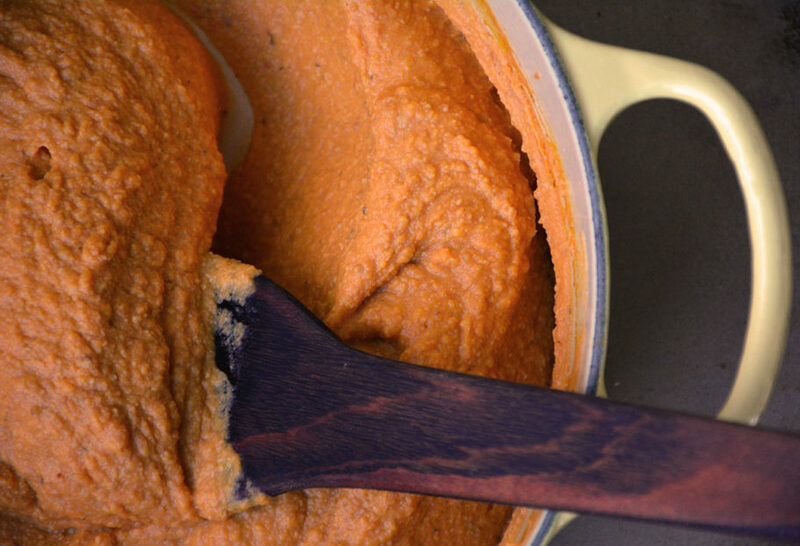 Continue to cook at a medium simmer until the sweet potatoes are completely cooked through, soft, and the tip of a paring knife can easily go through any piece, about 15 to 20 minutes. Drain and reserve. Place half of the sweet potatoes and half of the pecan and milk mixture in a food processor. 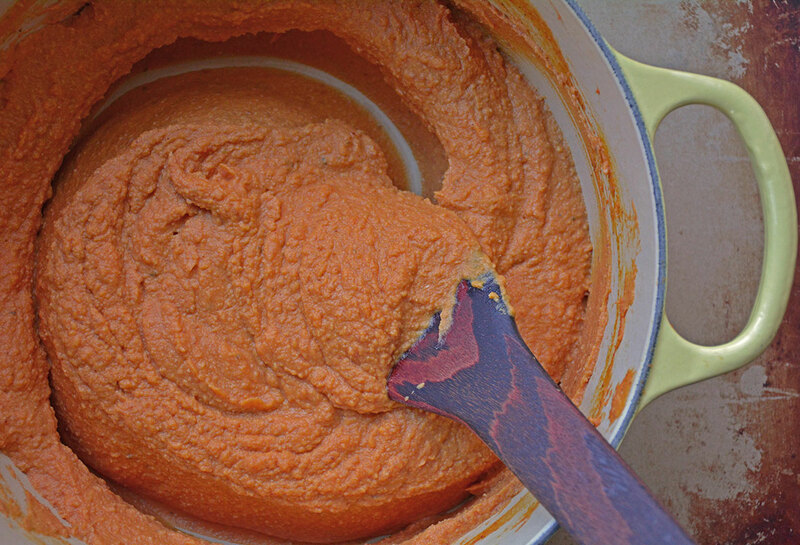 Puree until completely smooth, then scrape into a bowl. Repeat with the remaining sweet potatoes and pecan and milk mixture, but this time add the adobo sauce and 1/4 teaspoon salt. Puree until completely smooth and scrape onto same bowl. Set the same large saucepan you used to cook the sweet potatoes over medium heat. Add the butter, once it melts and bubbles, add the sweet potato mix. Stirring with a spatula, pour in the cream and cook for a couple minutes more, until completely heated through. Serve. Pati, why do you do the potatoes in two batches? And why the butter separately? Once the potatoes are done can you blend it all together with melted butter and crema folded in at the end. Oh because my food processor isn’t big enough to do it in one batch. If yours is big enough, go for it! Pati, thanks for answering. I made this after I posted the question. Duh. My bad. My processor isn’t big enough either! LOL Anyway, thanks for the recipe. It is delicious and very unique. So glad you enjoyed the recipe, Patti! So glad you made the recipe your own, Gladys! Can La vaquita Crema Mexicana be used instead of FUD? Of course! I like to use FUD, but you can use any crema you have. Enjoy, Ashley! I have been so excited to make this. I saw the episode earlier this year and have had it bookmarked ever since. I am wondering if this dish must be served immediately or can I make it in the thanksgiving morning and keep it warm in a crockpot until it’s dinner time? Thanks for your help. Oh of course you can make it ahead of time in a normal pot. Just reheat over low heat before serving! I eat it as a puree! I made Cowboy Beans, Carnitas and these Sweet Potatoes last weekend. All were DELICIOUS! My son couldn’t stop telling me how good everything was. Thanks, Pati, for such foolproof recipes that make me look like a pro in the kitchen. Feliz Navidad to you and your family! I tried to find the recipe for nana Jose’s cake and couldn’t find it. Would you send it to me? Thank you! Hello Pati, I feel like you are a friend of mine. I watch your shows when ever I get the chance. I do not have regular tv. I have Roku. The other day you made a mole type sauce to add to the veg. beef soup that looked delicious!! I made this today and it is different, but YUMMY! I used slightly less chipotle sauce, it had just enough smokey flavor. The chipotle paired well with the thyme. I don’t have a food processor, used a hand blender instead. It worked out fine, maybe not “puréed”. I’ll definitely make this again! Thanks Pati!! I am thrilled that you loved it! Happy Thanksgiving! Thank you so much for your help, you were very helpful. Hi! Pati I would like to know if I made some chicken tamales and I freeze it with out cooking, Do you know if my tamales are going to lost the flavor after a while when i decide to cook it..
Hello, Good Afternoon, I Love Your show, if there is, another cookbook,out soon?? Hi! Paty I would like to know if I made some chicken tamales and freeze it with out cooking, Do you think that my tamales are going to lost the flavor after a few days when I decide to cook it or will have the same flavor. Hola Maria, they will have the same flavor. Actually, you can freeze them once they have already been cooked (I prefer that), letthem cool and freeze them. Then just reheat in the steamer over low heat; they stay divine. Badia Spices has it – I’ve found all of their products to be very good, fresh and reasonably priced; in the ‘ethnic’ section or Hispanic section of your grocery – not sure where you are though – maybe you can order on-line – Pendery’s has bulk dried spices as well and I’ve found them to be prompt and quite pleasant to deal with. Good luck — hope you can find the Chipolte powder – it’s also great in scrambled eggs! Love this holiday. As you know I open my home to anyone this holiday. I’m happy to say I will be having 10 people this year. ? I just made this recipe, with canned & rinsed with water yams. Yum Pati, thanks 4 sharing your recipe. I take it you can roast the potatoes instead of boiling? Hi Pati. Well, you’ve done it again — another awesome recipe! I’m looking forward to trying this one. Have a wonderful Thanksgiving! Tiene Ud. una receta autentica, autentica para pambazos? O si no, para el chorizo mexicano? I remember my uncle making “tepache”. It was made with pineapple peelings. Could you give me the recipe. It has a bit of a kick. Love your stuff, have your book and tried some of the recipes. Ay Chihuahua! I am so bummed! Pati’s Mexican Table is no longer carried on my local Seattle PBS station! It was my favorite thing to do on a Saturday afternoon. I always looked forward to spending a fun half hour with you Pati. I’ll miss that. I’ve petitioned KCTS to bring you back! I have your book but it’s not the same as getting to watch you cook with your boys. Que lastima! Hola Pati, no tienes un lugar en español donde pueda encontrar tus recetas???? I can’t wait to try this recipe!It sounds so good!Thank you Patti. Happy Thanksgiving to you and your family! So thrilled you like the recipes! Happy Thanksgiving to you as well! Hi! Patty , how are you ? I love your show , your recipes and your teaching ! Can I add a habanero chili to the adobe recipe for a little more heat ? I really love spicy food ! Thank you so much ! God bless you ! Great idea. Will give that a try. Love the coconut idea! champurado. You made it in one of your receipt PBS shows. how they like it. Mi family grigos. They like like mi case mexican con todos los clorses. WE will see. Will send you a photo. HAPPY THANKS GIVING to your and your family. Tell JUJU he is so adorable. I need a recipe for an awesome casserole stuffing. Please help!?!?!? Hello Pati, I copied the Sweet Potato Pecan recipe. I have to say that it sound very good. I love “Sweet and Hot” I am just not sure how to serve it. would it go in a pastry crust? or just a spoon on the side with dinner? I love all of the recipes of yours I have tried, and I have tried many. Thanks for the torito receipi it was a pleasure to try it. Jajaja, te reconozco, Papito. Ya casi te veo en México, te quiero mucho. Hi Pati, I can’t wait to make this new recipe. On my way to the store….I’m sure it will be delicious, thanks for sharing! You went and did it. Now I have to go out and purchase all these ingredients. Gee, I thought I was all set for Thanks. I have always wondered about sweet potatoes. Well me Americana friend, I will try it and let you know. I will let you know is FUD cream is readily available on the West coast. Happy Thanksgiving and may we live to see the day when Black Friday is a thing of the greedy past. Family and food, that is what Thanksgiving is and should always be—Cheers. Hey Ed, yes it is! FUD should be available, Ask your grocer, hope you like the recipe! What is a serving size? Do you serve it with whipped cream or any other toppings like roasted pecans or walnuts? Looking forward to trying it out. I like to serve it just like this, Grace, as a side! But you can garnish it with some chopped chives, or chopped toasted pecans. It would be lovely too. We’ve only recently been able to get the Food Network via Fetch TV here in Australia. On that, they have been showing one of your shows on the Asian Food Channel (which we cannot get). Can you advise if your programmes are either being planned for (or have been on) the Food Network; or if there has been any discussion about getting your programmes on our new free-to-air Food Channel on SBS-3 in Oz? Many thanks! Let me find out for you, Dav! My mother in law used to make the most delicious pork tamales with black olives. She also used chicken broth instead of lard to make the masa dough. Do you have a recipe for this? Wondering what you would recommend as a way to make the sweet potato, pecan, chipotle dish without the milk, butter or FUD and still achieve roughly the same result. Also do you ever think you could make the sweet potatoes like this but without pureeing them? Yes, you can make it without the milk, butter or cream. You need to substitute for some other liquid, the same goes for butter. Is there any other milk that you like? Almond? Coconut? How about coconut oil instead of the butter? And yes, you can mash it all with your masher or a large spoon and just finely chop the pecans before adding them in the mix. Let me know how that goes! Hola! Estoy tratando de ver cómo le hago para también tenerlo en español… espero tener resultados pronto! Where can I buy one of those metal tortilla makers? The ones where you put the ball of masa in it, and then press down. You can buy it on Amazon! http://www.amazon.com/Victoria-85008-Tortilla-Press-8-Inch/dp/B00HWEIKZO/ref=sr_1_2?s=kitchen&ie=UTF8&qid=1448393208&sr=1-2&keywords=tortilla+press Happy Thanksgiving to you too! Any recipes for a pumpkin flan? I do not, but that is a fantastic idea, Kim! Will try to feature a pumpkin flan recipe soon! Pati, a new friend gave me a Scotch Bonnet pepper from her garden. It’s so beautiful but I understand it’s very, very hot. She didn’t know I don’t eat spicy foods, alas. Is there a recipe I could use it in that would include a way to really tone down its heat? I was thinking of drying it but wondered if that would make it even hotter. Yikes! You can broil or char it to turn down the heat a bit… Use it in recipes as you would use a jalapeno but be mindful it’s very hot so start by adding a small amount at a time! Enjoy! Nana Jose’s cake is a hit, even at our church! We have several “gluten-free” members, and they just love it. My question: Is it OK to line the Springform pan with crushed pecans, or will they burn when baking? Same with the top: Can I add some crushed pecans, either before or after baking? A pumpkin pie recipe I saw on CREATE calls for chipotle powder and I can’t find any in my grocery stores, Mexican or WASP. Are there any substitutes you recommend? It’s for a regular pumpkin pie with added ginger and chipotle powder. Yes, Helen. Just use any other dried ground Mexican chile. It will not be the same taste, but it will add the called for kick! Chipotle powder will be with the regular spices in the spice aisle in any grocery. You don’t need to look in the specialty section unless you need bulk.